Bio Notes: Colin Sinclair was born in Glasgow in 1879, the son of John Sinclair, shipwright and Annie McGregor. His family came from Glassary in mid Argyll and in his youth he spent much of his time there with his grandparents. He was educated at Bellahouston Academy and articled to H & D Barclay just before Hugh's death in November 1892 and remained as an assistant after completing his apprenticeship in 1897. During that period he attended the University of Glasgow where he graduated MA and studied at the Glasgow and West of Scotland Technical College and Glasgow School of Art under Professor Charles Gourlay and William James Anderson, his travels during the holidays seemingly being limited to Normandy. 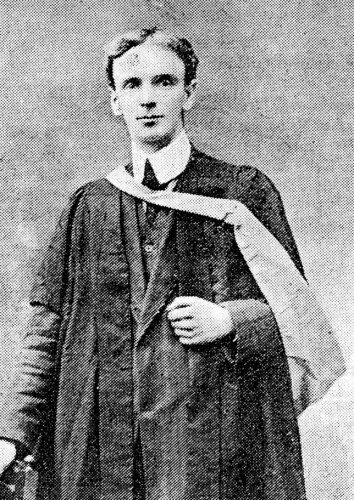 In 1907 he became assistant to Gourlay at the Royal Technical College, lecturing on both philosophical and constructional subjects, but he remained part-time senior assistant in the Barclay practice. Surprisingly he either did not sit or did not pass the qualifying exam, being admitted LRIBA on 6 June 1910, his proposers being Barclay, Robert William Horn and James Campbell Reid. Sinclair's FRIBA nomination papers state that he commenced practice on his own account in 1911, which suggests that he became a junior partner in the Barclay firm at that date; in any case, he remained with the same firm until 1917 when he inherited it on David's death, continuing it under the same name thereafter. His practice was small and chiefly in Argyll but this was no barrier to him being admitted FRIBA in early 1921, proposed by William Brown Whitie, John Keppie and John Watson. By that time he had become involved in several professional societies, having been a president of the Architectural Craftsmen's Society, served as a member of the council of the Glasgow Institute of Architects, and become a Fellow of the Society of Antiquaries of Scotland. In the inter-war years he was in partnership with John Begg Campbell (born 1882) who had also been articled to David Barclay, remaining in the office for twelve years and subsequently spending a year as Clerk of Works for Stranraer High School before being appointed designer of ship interiors for the Fairfield Shipbuilding Company Ltd in Govan. The partnership of Sinclair & Campbell ended in 1940 when Sinclair again became sole partner. Although he kept the office open he had little architectural work and was chiefly occupied in scholarly pursuits related to West Highland culture which brought him a PhD, whose title was 'Celtic Art in Architecture'. He was one of the Scottish delegates to UNESCO from 1947 and published 'The Thatched Houses of the Old Highlands' in 1953. He was also a painter 'of some ability' in both oils and watercolours according to his RIBA obituarist and a composer. Sinclair married Jessie Wilson McIntyre, daughter of John Lindsay McIntyre of the school board offices, at 193 Bath Street on 24 June 1913. Their son Iain was living at Station House, Giffen, Beith at the time of Sinclair's death at his home 50 Ralston Avenue Crookston on 26 October 1957; he left estate of £5,255 19s 7d.